Let's hear it for pork on pork action, first of all. If you're a meat-lover, this is a spectacular and pretty easy recipe to have in your arsenal. For starters, I love when roasted meat recipes don't require any stove top pan-searing prior to roasting. This is one such recipe that simply gets prepped in mere minutes, then tossed straight into the oven - without searing. You'll be floored at how little work and effort can yield such amazing results. The dish requires minimal ingredients, gets cooked all in one skillet and is pretty fail-proof so long as you keep an eye on the internal temp of the meat. Serve this up alongside a salad or vegetable for an easy-peasy meal. It's simple enough for weeknights, yet special enough for Sunday dinner. Preheat oven to 400 degrees. Add 1 tablespoon oil to bottom of a 10-inch cast iron skillet. Set aside. Season pork on all sides with salt, pepper and garlic powder to taste. Lay bacon slices across fat side of pork. Place in center of skillet. Tuck bacon under bottom of pork tightly. 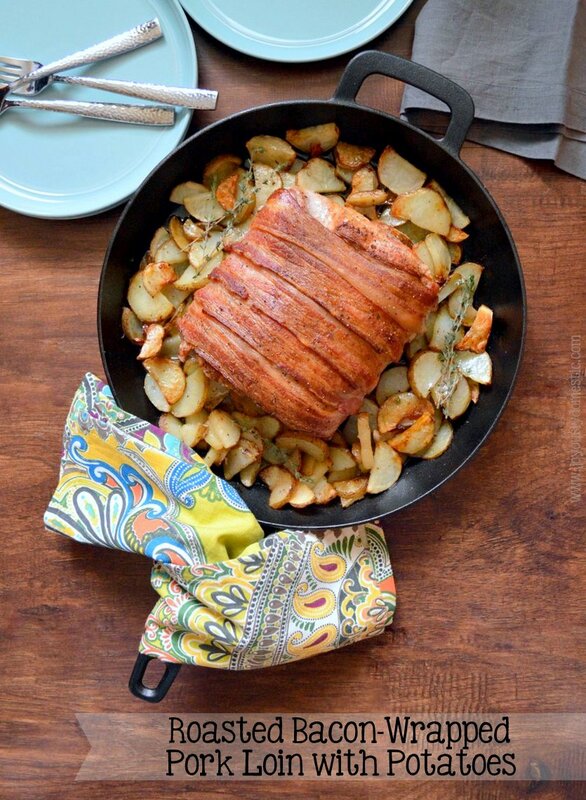 Scatter potato slices evenly around pork. Drizzle with 1 tablespoon oil. Season potatoes with salt and pepper. Tuck in thyme throughout potatoes. Roast in oven until internal temperature of pork reaches 140 - 145 degrees - about an hour. Remove from oven. Loosely tent the center of skillet with foil to cover pork. Allow to rest for 10 - 15 minutes prior to slicing. Made this last night. It did take about 15 extra minutes of roasting to reach temp that we prefer. But, it was amazing! Another great recipe. One idea ... I do find that we like our taters extra brown and crisp, so I removed the pork when it was done and allowed potatoes to roast a little longer while meat rested. Worked perfectly. Such an easy recipe too.